You can use Kinect to control the Xbox Dashboard using both your voice and gestures. To get the best Kinect experience, make sure you have the latest console software. Hold your arm straight out to the side and bend your elbow upward. Now wave your hand by moving your forearm left and right (Wave to Kinect). Once you wave at the Xbox Dashboard, a hand cursor appears and you can now use gestures to navigate the Dashboard instead of a controller. Point the palm of your hand toward the screen, and move the on-screen hand over the item you want to select. To select an item, keep your hand over the item until the circle completes. To move to the next area of the Xbox Dashboard, move your hand to the edge of the screen and “swipe” across your body. When you’re at the Xbox Dashboard, say "Xbox" and the Kinect speech bar opens. You can now say any of the words that appear on screen. For example, say “Xbox Social” to move to the Social area of the Dashboard. Say “Xbox Bing” and then say what you’d like to search for. For example, you can say "Xbox Bing Halo" to search for games, downloadable content, music, and movies related to Halo. Note Bing Search is currently only available in the United States, United Kingdom, and Canada (in English). 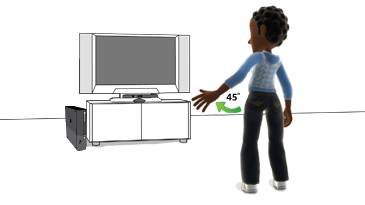 Similar to the Xbox Guide, the Kinect Guide is a quick and easy way to start Kinect activities. You can view your friends, messages, achievements, and troubleshoot Kinect sensor problems from the Kinect Guide. 1. 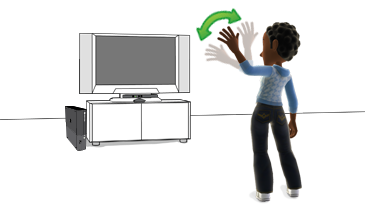 Wave to Kinect to activate motion control. 2. Position both arms at your sides. 3. Now move your left arm straight out at a 45 degree angle from your body. 4. Hold this pose until the Kinect Guide opens. Would you like to contact Support regarding the "Use Kinect with the Xbox Dashboard" issue you were reading about or a different issue?